Lithium-ion batteries power electronics and electric vehicles, but very few of these ubiquitous energy storage devices are ever recycled due to challenges related to their chemistry. A new company, based on research by WPI mechanical engineer Yan Wang, may be the first to bring a viable recycling technology to market. And it all began with a friendship and a hunch. First commercialized in 1991, lithium-ion batteries have become the de facto power source for portable electronics and electric and hybrid vehicles. The global market for these rechargeable energy storage devices, valued for their high energy density and light weight, was over $30 billion in 2016 and may reach close to $70 billion by 2022. That rosy forecast aside, lithium-ion batteries have their drawbacks, including the energy consumption and environmental issues associated with their manufacture (see story at the end of this page). But one of the most significant issues facing manufacturers and customers comes when the batteries reach the end of their useful lives. Lithium-ion battery cathodes are typically made from a mixture of lithium, cobalt, nickel, iron, and manganese, though the exact proportions used in a particular battery may be impossible to determine. To fully recover those materials, a recycler needs to be able to sort the batteries by chemistry. Since that is usually not possible, most recyclers simply burn the devices, producing a slag from which some materials (though not the lithium) can be salvaged. In truth, only about 10 percent are ever recycled. The rest are trashed, putting a wealth of hazardous materials into the environment. And since most battery components are not reused, manufacturers must import more and more raw materials—often from poorer countries with lax environmental and human health rules. A solution to this global problem may be on the horizon. It began seven years ago at WPI, with a budding friendship and a hunch. Yan Wang joined WPI in 2010, fresh from a postdoctoral position in the laboratory of Yet-Ming Chiang at MIT. A world-renowned materials scientist and energy storage expert, Chiang has founded several companies, including A123 Systems, a developer of advanced lithium-ion batteries. Wang says he was impressed by his advisor’s entrepreneurial passion. With that end goal in mind, Wang launched several research projects early in his WPI career, including one aimed at increasing the energy density of flow batteries, which can store power produced by solar and wind arrays. His innovation, which replaced the electrolyte solutions typically used in these units with thick suspensions of nickel and zinc particles, won him a $40,000 Catalyst Award from the Massachusetts Clean Energy Center. A year before Wang arrived, WPI and Colorado School of Mines established the Center for Resource Recovery and Recycling (CR3), a National Science Foundation (NSF) Industry-University Cooperative Research Center (I/UCRC). Led by Diran Apelian, founding director of WPI’s Metal Processing Institute, CR3 works with industry to develop new technologies that recover, recycle, and reuse materials throughout the manufacturing process. From Yet-Ming Chiang I learned that doing good research is not enough. You also must try to commercialize it. 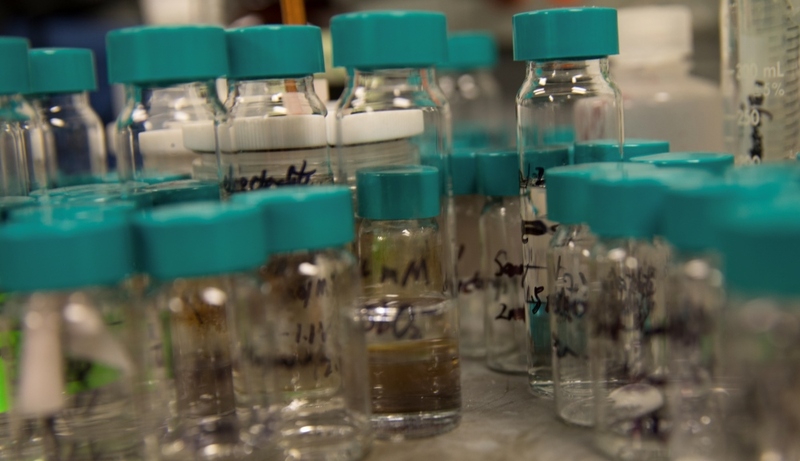 Wang focused first on cathode chemistry, the Achilles’ heel of lithium-ion battery recycling. He wondered if it might be possible to devise a recycling process that could work for any battery, regardless of the cathode’s make-up. He started by buying the powders battery makers use to fabricate cathodes and mixing them together—as if a recycler had shredded a pile of batteries and tossed the insides into the same bin. 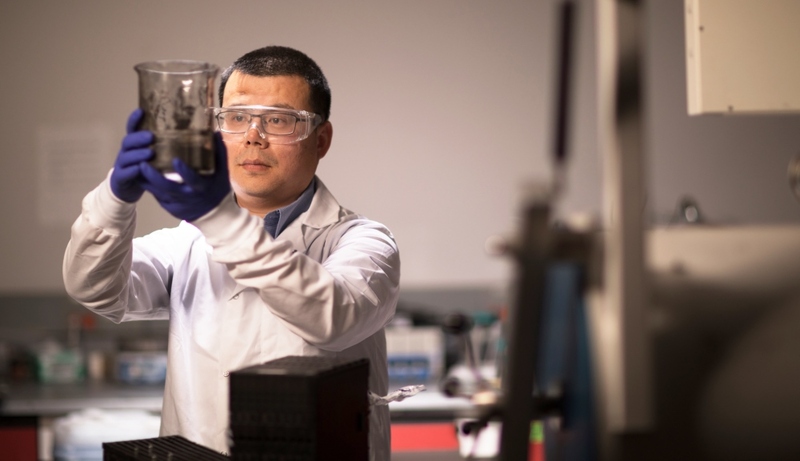 Through trial and error, Wang, Apelian, and graduate student Haiyang Zou hit on a now-patented chemical process that removes impurities from the mixture and creates a solution consisting of just lithium, cobalt, nickel, and manganese. In the final and critical step, the solution can be adjusted to precipitate out new cathode powders with any desired chemistry. With CR3 and NSF funds, Wang showed that his process worked well with mixed cathode materials extracted from shredded batteries, though the cathode powers produced were not yet the equal of those available commercially, says Eric Gratz, a postdoctoral researcher who’d earned his PhD in materials science at Boston University. More, the positive results convinced Wang that he might have the basis for his first company. He successfully applied to the NSF’s I-Corps program, which encourages researchers to expose their ideas to the scrutiny of potential customers. The program requires the researcher, as the technical lead, to work with an entrepreneurial lead. Gratz stepped forward to fill that role. Wang asked Todd Keiller, director of intellectual property and innovation at WPI, to join the project as a mentor. In late 2014 Wang, Gratz, and Keiller went on the road to talk with customers, including battery makers and end users—particularly car companies. The grant requires at least 100 customer interviews; the WPI team completed 137. Having already shown that it can scale up the process from recycling 1 kilogram of batteries per day in the lab to at least 50 kilograms, Battery Resourcers will now seek to recycle 500 kilograms, or half a ton of batteries, every day in its pilot plant in Worcester. Expected to be operational this summer, the plant represents the company’s final hurdle before full-scale commercialization. The meetings confirmed the commercial value of the recycling innovation and gave the team a better sense of how a new company might fit into the battery ecosystem. Energized by the experience, Wang, Gratz, and Apelian founded Battery Resourcers. Wang, choosing to retain his academic post, became the company’s chief scientist, while Gratz assumed the role of CEO. Apelian, drawing on his industry network, assembled a distinguished board of directors, which he now chairs. The members are A123’s founder Yet-Ming Chiang; Mike Aspinwall ’75, a WPI trustee and managing partner of CCP Equity Partners; Pearson Spaght, founding partner of Fletcher Spaght Ventures; and David Spencer, founder and chairman of wTe Corp., a leading recycler of metals and plastics. With Keiller’s help, the founders sought the advice of WPI’s Tech Advisors Network (TAN), a group of more than 80 alumni, faculty, staff, and friends who are experienced innovators, entrepreneurs, and investors. A TAN team, including an alumnus who’d worked in the battery industry, was assigned to shepherd Battery Resources through the next steps in its development. Bigger wins were awaiting Battery Resourcers. Late in 2015 the company’s fortunes were bolstered by an NSF Small Business Technology Transfer grant and a $1 million award from the United States Advanced Battery Consortium (USABC), a collaboration of the nation’s “big three” auto makers (Fiat Chrysler, Ford, and General Motors). 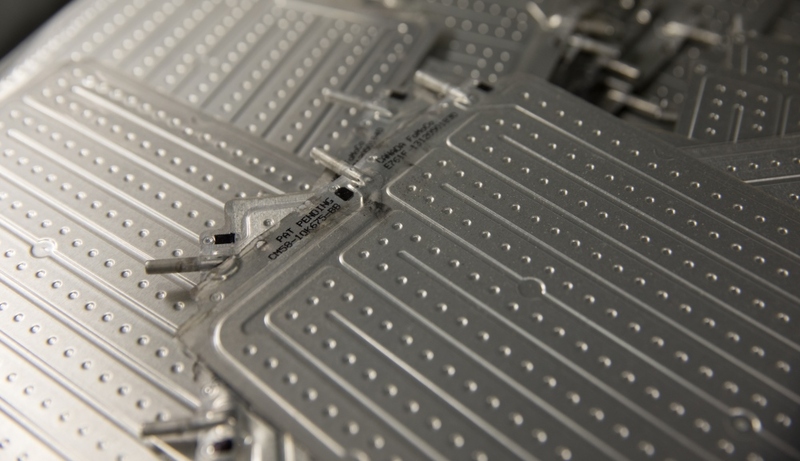 The USABC funds (half of which came from the U.S. Department of Energy) were for a project aimed at scaling up the recycling process and producing actual automotive batteries from the recovered cathode power. lbatteries, but lowers the cost of making new ones. As part of the USABC project, WPI awarded a subcontract to A123 to evaluate the cathode materials that Wang’s team was producing from recycled batteries (the materials have also been independently verified by Argonne National Laboratory) and to construct and test new batteries. Wang says the results have been excellent: the cathode materials are now as good as those available commercially, but at 80 percent of the cost, and the batteries are the equal of any available on the open market. As the USABC project winds down, Wang says he anticipates applying for another award from the consortium to further explore how the company can meet the recycling needs of auto makers, virtually all of which are committed to greatly expanding their fleets of electric vehicles. In the meantime, Battery Resourcers is making another bold push toward the marketplace. 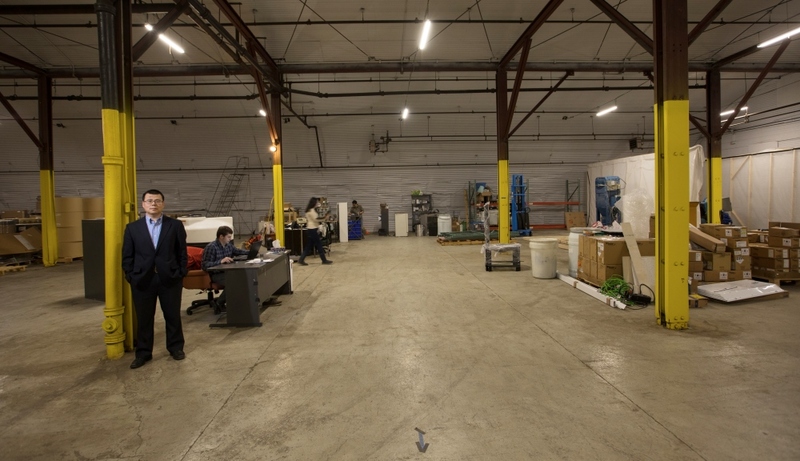 In late 2017 it leased 5,000 square feet of space in an industrial building in Worcester to set up a pilot plant for its recycling process. This could be a big company. I can’t put a number on it, but it’s extremely promising. Lithium-ion battery manufacturers have an energy problem. The current process for making the batteries’ electrodes uses a slurry of either lithium compounds or graphite mixed with a binder and a toxic solvent. The mixture is spread on a metal current collector strip and then heated to dry it, while the solvent is collected to be reused (and to prevent environmental contamination). It’s an expensive and protracted process. Two companies spun off from WPI research labs are testing simpler processes. One is AM Batteries, the other start-up to emerge from the lab of Yan Wang. With Heng Pan at the Missouri University of Science and Technology, Wang is developing a process to make electrodes using additive manufacturing. The process starts with a dry powder of anode or cathode materials and binder that is electrostatically sprayed onto the current collector. The coated collector then passes through a pair of hot rollers to compress the electrode to a set thickness. Wang says laboratory studies indicate that the process, which won the 2017 Catalyst Award from the Massachusetts Clean Energy Center, could reduce the cost of the batteries by as much as 20 percent, while also producing units with better electrochemical properties. Wang is currently seeking venture capital to fund a scale-up facility. The other, Kinetic Batteries—founded by Diran Apelian and Aaron Birt, a PhD candidate in materials science and engineering at WPI and a 2017 Forbes 30 under 30 winner for manufacturing and industry—also starts with dry powder, but it uses a process called laser-assisted cold spray to deposit the powder on the conductor. In cold spray, the particles are accelerated to supersonic speeds, which causes them to fuse to the substrate. Having won a $40,000 award from the Massachusetts Technology Transfer Center and a $10,000 Kalenian Award (which provides seed funds to advance innovations by WPI students, faculty, and alumni), Apelian and Birt believe they have hit on a process that will make cheaper batteries with better properties, and also make it possible to produce customized cathodes of any size.